DESCRIPTION Available for immediate occupation this attractive modern detached house with spacious family accommodation occupying a quiet position in a favoured road of the ever popular Abbey Manor Park development. 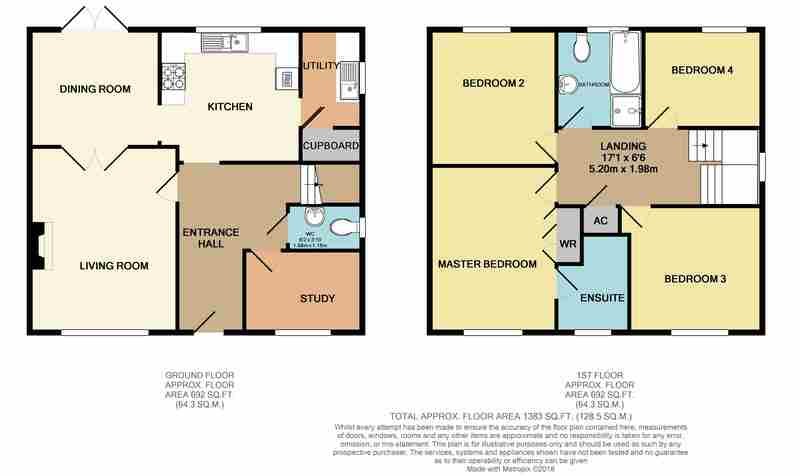 Benefiting from gas central heating and double glazing the generously proportioned accommodation comprises an entrance hall, cloakroom, study, spacious lounge, dining room, fitted kitchen and utility room. Upstairs there is a large landing, master bedroom with en suite shower, three further bedrooms and a family bathroom. There is a double garage at the rear of the property and privately enclosed South facing gardens. An excellent example of this popular style of house and an internal viewing is strongly recommended. SITUATION The property occupies a quiet position on the favoured Abbey Manor Park development on the North West fringes of town, having local shops and primary school nearby, secondary schools within easy reach, Houndstone Retail Park, adjacent supermarket and of course Yeovil Town Football Club. Yeovil town centre with its comprehensive range of shopping and leisure facilities is just a couple of miles distant and access via the Cartgate link road to the A303 is just 5 miles distant. CLOAKROOM with close coupled WC, pedestal wash basin with tiled splash back, radiator and double glazed window to the side. STUDY 9’8” (2.94m) x 6’8” (2.04m) with radiator, laminate flooring and double glazed window to the front. DINING ROOM 9’8” (2.95m) x 10’9” (3.27m) with coved ceiling, power points, radiator, laminate flooring and double glazed French doors to the garden. UTILITY ROOM 8’2” (2.5m) x 5’2” (1.58m) having a stainless steel single drainer sink with base cupboard under, plumbing for washing machine, tiled floor, cupboard housing gas fired boiler, work surface with part tiled splash back, under stairs storage cupboard, double glazed window to the side and part glazed door to the garden. HALF LANDING with double glazed window to the side. EN SUITE SHOWER having a tiled shower cubicle, close coupled WC and pedestal wash basin with part tiled splash back, shaver point, vinyl flooring and double glazed window to the front. BEDROOM TWO 11’4” (3.45m) x 10’8” (3.26m) with radiator, power points, telephone point and double glazed window to the rear. BEDROOM THREE 10’10” (3.32m) x 10’8” (3.26m) with radiator, power points and double glazed window to the front. BEDROOM FOUR 9’10” (3.01m) x 8’2” (2.49m) with radiator, power points and double glazed window to the rear. OUTSIDE The property occupies a good level plot with shared drive at the side leading to the DETACHED DOUBLE GARAGE at the rear. The privately enclosed rear garden includes a large paved patio area and lawn and enjoys a sunny Southerly aspect. OUTGOINGS The property is in Band E for Council Tax purposed with the annual amount for 2018/2019 being £2,023.51. 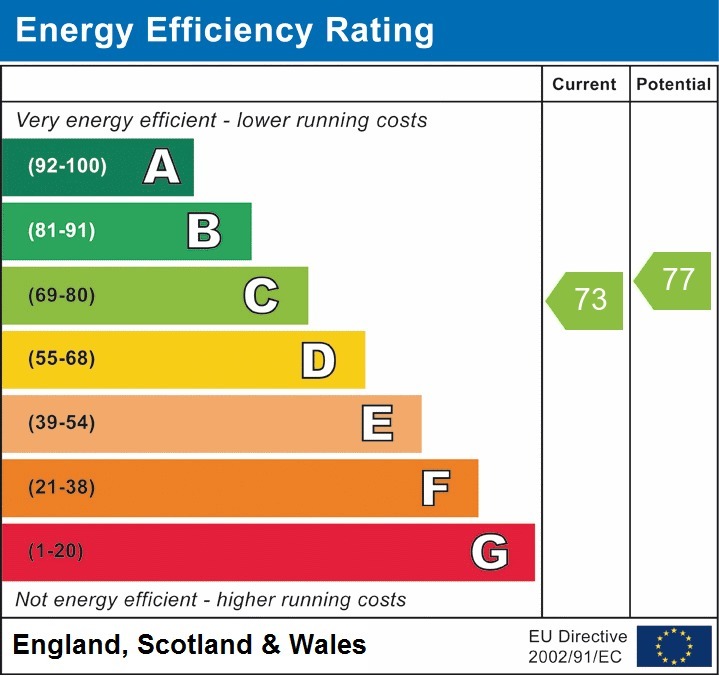 Energy Efficiency Rating C.